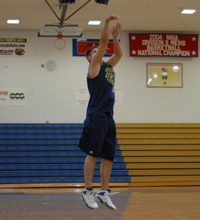 Getting in the habit of locating your target (the rim) earlier will improve your shooting percentage. Why? Locating the rim just a split second earlier gives your brain more time to subconsciously calculate distance and focus on your objective. Your eyes should be on the rim as early as possible. To make this little trick work, you need to develop this habit in practice, which carries over into games. You’ve probably heard this a hundred times but there’s good reason for it. Holding your follow through solves a multitude of shooting problems. This simple movement helps you maintain good basketball shooting technique without even thinking about it. A common mistake is for players to follow-through with a tense wrist. Your wrist should be as relaxed as possible. Your hand should finish on line and even bounce a little during the follow-through. To improve the straightness of your shot, try a colored basketball during practice. This makes it easy to see the rotation and direction of the ball. The immediate feedback makes it quick and easy for you to adjust and improve your shot. TOO many kids try to copy Kobe and end up with bad shots for the REST OF THEIR LIVES! Youngsters have no business trying to hang like Kobe and shoot. Kobe is a freak of nature! You should shoot as you’re going up (at least 1 inch before you reach the top of your jump). Trying to mimic Kobe’s shot will just earn you a place on the bench and lots of frustration. One of the worst things you can do is think about your shooting mechanics during a game. Thinking about your shot is for practice, NOT for games! In fact, you should only think during certain parts of your practice. It’s ok to think during a form shooting session or when learning a new skill, but once you start developing rhythm and get further into practice, don’t think! During games, train yourself to think about other things or nothing at all. You’re going to miss a few. So what! Don’t think, just shoot the damn ball!!! If you adopt this mentality, your shooting percentage will go UP. Eliminating negative thoughts can dramatically improve your basketball shooting percentage. Before each game, practice, and shooting session, tell yourself that you don’t care if you make any baskets. Say it out loud or in your head several times. THEN, when you go to shoot (right as you’re catching the ball), say something to yourself like, “Nice shot. I can do better.” In other words, try not to care if it goes in or not. This simple little trick helps you to relax into the process and not think about the result. Using this technique will be enough to break you out of mini slumps and restore your confidence. DID YOU KNOW that a shot with a flat 35 degree arc only has .6 inches of margin for the ball to clear without hitting the rim? The shot has to be almost perfect to get a swish. BUT a shot with a 45 degree medium height arc has a 3 inch margin of error! That’s right. Just by increasing the arc of your shot, your margin of error could increase as much as 500%! How many shots bounce OUT of the basket because you missed by just a fraction? As a general rule of thumb, finish your follow through with the rim clearly visible beneath the fingers of your shooting hand. That way you will ensure that you have a decent arc on the shot. Shots with proper arch have a much better chance of going in. Just don’t go too high. Because if your arc gets too high, you’ll loose your distance control. Simply by watching great shooters groove their shots over and over, you can improve your confidence and form. The good habits and examples can be contagious. As you watch, the good form becomes ingrained in your mind. Not to mention, you should never stop learning. There are lots of good shooting DVDs and books for you to learn from. Spend a little time during each practice lined up along a court line about 20 feet from a partner, shooting back and forth and trying to have the ball bounce as close to the line as possible. This simple practice technique will help you to fine tune your control of the precision of your shot. Balance is a very important aspect of shooting. You achieve balance primarily through a proper stance and footwork. After your shot, you should land in front of where you started. You can do this by making sure that your momentum is going towards the basket on every catch. You should also establish good balance from your stance. You’d be amazed at how filming your shot in both games and practices can help you. That’s right. Most players haven’t seen their own shot before. Seeing your shot on film can help you to detect poor mechanics and motivate you to make commitments for improvement. Bottom line– it’s a great way to refine your shot. When possible, try to shoot with a partner. Because when you’re alone, you end up chasing the rebound before following through properly. You shoot and then you start following the shot immediately so you can get lots of reps. Guess what? This can mess up your follow-through. You need to FINISH each shot and hold your follow-through. That’s why we recommend getting a partner to rebound for you. Now just because you can’t find a partner you can (and should) still practice by yourself. Just be aware of holding your follow through. Using basketball rebounding and return devices can literally double the number of shots you can take in practice. Just think how much time you spend chasing the ball when you practice. A return device solves that problem and lets you take more shots in less time. When you catch the ball, you should get the ball to your set position as quickly as possible. This will speed up your shot. Your set point can be anywhere between your hip and your shoulder. Too many players spend their hard earned money on shooting gloves and gimmicks, thinking this will make them great shooters. You can’t use these devices during a game so it really doesn’t do you much good. You need to learn how to shoot effectively without these devices. There is NO magic pill. A fluid motion means that there are no jerky movements or stopping points, just one constant flow from start to finish. Consistency can’t be stressed enough. Your feet, arms, set point, and jump height should use a consistent motion every time you shoot. All the greatest shooters in the world have amazingly consistent movements. Before every practice and game, face the basket and shoot 50 EASY shots about four to ten feet from the basket. Not only does this improve your shooting form, but it helps to develop phenomenal confidence. You’ll quickly become very good at grooving these shots over and over. You’ll see the ball going in the basket over and over. You’ll swish the ball repeatedly and probably shoot 60%, 70%, 80%, or more, which is great for your psyche. Why do you think that NBA players do this before games? Why do you think that Tiger Woods starts all of his practice sessions by making 100 three-foot putts? Because it works! Don’t overlook this powerful strategy. Head to the gym and shoot a bare minimum of 50 shots. Ask your partner to chart your shots. The KEY is to chart the detailed results of each shot. You will track how many shots fell short, too long, to the left, and to the right. This information will help you to determine what you need to work on. For example, if you consistently miss short (like many players do), you’ll need to work on your power and distance control. If you consistently miss to the right and the left, you need to fix the mechanics of your foot and/or arm alignment. To make game shots, you need to practice game shots. You should use good shooting drills and practice movement off screens, cuts, chairs, and pivoting in both directions. There ya go… 21 simple ways for you to improve your basketball shooting percentage. Now get to the gym, apply what you’ve learned, and knock down more shots!! What is “Perfect” Basketball Shooting Form? Recently, I received an interesting email about Dave Hopla’s shooting form. It was in response to listing Dave as one of the shooting experts that we interviewed in our new Basketball Shooting Guide. The email stated that Dave Hopla did NOT have great shooting form in the picture that was displayed on our site (you can see the actual picture on the right). Now in all fairness, this is not a good picture of his actual shooting form. But this comment brings up a really interesting and important point about shooting the basketball. You don’t need “perfect” or even “great” mechanics to be a great shooter. You need CONSISTENT & REPEATABLE shooting mechanics. If your shot is the same every time, it’s easier to make adjustments. While I do highly recommend using “good” shooting mechanics, you can also look at Larry Bird’s and Peja Stojaković’s shooting form. Anybody with some knowledge of how to shoot would quickly notice that they had bad shooting form, yet they are arguably two of the top shooters that the NBA has seen in the last 25 years. I think us coaches (me included) get a little obsessed sometimes with perfection not only when it comes to shooting, but other areas of the game as well. We want the players to have the perfect defensive slide or the perfect passing technique. We forget that basketball is an art. There is no perfect way to do anything. The real question is “Is the player effective?” which pertains to anything in basketball. I’m not saying that coaches shouldn’t critique and help players make adjustments to become a better player, we just need to be careful and use logic and rational when doing so. If a kid knocks down 50% of his three point attempts, but his elbow sticks out while shooting, I’m not going to be the one to change it. Now, if you have a kid with bad shooting form that shoots 20% from the field, you should try to help the player make some adjustments to his/her shooting form. That’s where coaching comes into play and where the top coaches/trainers earn their money. They know when to leave players alone and when to offer advice to help them become a better player. And back to Dave Hopla, the guy makes about 98% or 99% of his shots. I’ve never personally seen his speeches or shooting demonstrations, but I’ve heard they’re simply amazing and very few people in the world if anybody can do what he does. He’s had demonstrations where he’s made 350 of 350 shots while talking to the audience the entire time. If any of my players could do that, I couldn’t care less how he shoots the ball. Some of the NBA’s best players such as Kobe Bryant have consulted with Hopla. He is also currently an assistant for Washington Wizards. So I do highly value what he has to say. The end goal is to put the ball in the basket. It doesn’t matter how pretty it looks. I know Dave Hopla does a heck of a job, so I’m more than willing to listen to what he has to say. What are your thoughts about basketball shooting form? We have FINALLY released the NEW Breakthrough Basketball Shooting System and Step by Step Guide!! How to improve your entire teams shooting percentage. 55 new basketball shooting drills. 8 super effective shooting workouts. How to consistently develop long range shooters. The mental aspects of shooting. How to teach shooting fundamentals. How to easily break your players out of shooting slumps. Tips from the world’s BEST shooters and instructors. How to become one of the best shooters in your league. The mental aspects of shooting and how to easily get an edge on your competition. How to get more playing time. How you could earn a college scholarship. How to increase your shooting range. 18 basketball shooting drills for players. Tips from the world’s BEST shooters and NBA instructors. The most exciting part about this program is that we have gathered advice and tips from some of the greatest shooting coaches and resources in the world. We gathered all the best information we could find and compiled it in ONE PLACE. We interviewed these 6 basketball shooting experts that have unbelievable credentials. We also reviewed and researched dozens of DVDs and books to make sure we knew everything there was to know about shooting the basketball. We’re really excited because this allowed us to create a phemonal product that is very unique and unlike anythign you’ve seen before. One thing you’ll discover is that the best time to improve shooting is in the off-season. Whether you’re a player trying to improve your shooting percentage, or a coach trying to improve your entire team’s shooting percentage… most of the improvements happen in the off-season. We’ll show you step by step what you should do in the off season and during the full swing of your basketball season. I had the opportunity to work out with Joe Johnson, NBA All-Star of the Hawks. He was in Miami for a quick vacation. This was what his schedule looked like. Monday – 11 am depart Miami. This is a guy who is 26 years old, single, wealthy and on vacation in one of the most decadent atmospheres in the world for the first time. Don’t let anyone tell you that NBA players don’t work hard. In China, basketball isn’t viewed as a sport that you wanted to gain glory in. Instead basketball is more of a tool to teach teamwork, unselfishness, and the value of working together. In fact, if a player on a national team scores 25 points in a game, it’s not considered a big accomplishment. It would actually cause the coaches to call a team meeting and it would be crisis time. Because the player would look like someone who was seeking headlines and trying to break out of the collective. This is an excellent reminder of what’s truly important. As a coach, you should think the same way… Basketball is a tool to teach teamwork, unselfishness, and the value of working together. When you think about it, basketball is an amazing tool and opportunity for us to teach kids about teamwork and how to be successful in life. Don’t lose sight of what’s important! View this video on leadership from walkthetalk.com : Leadership Video. It has some great stuff. It doesn’t matter if you are a coach or a player, you are a leader to somebody. It could be your players. It could be your teammates. It could be your family. It could be your co-workers. It could be a schoolmate. It could be anybody. www.walkthetalk.com has some fantastic videos and motivational quotes. If you haven’t signed up for their free newsletter, I would highly recommend it.